Evolution and Diversity: Panda's, its not all black and white. Panda's, its not all black and white. Most people know that the Chinese giant panda's are endangered, but maybe it wouldnt hurt to know a bit more about just how serious their situation really is. There are roughly 800 wild giant panda's, and more than 100 in captivity (mostly in zoo's, breeding centres and special reserves in China). 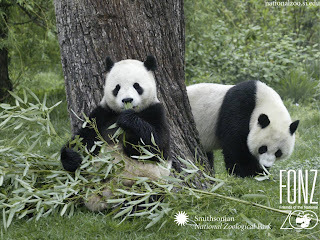 Its no secret that these panda's primarily eat bamboo, but in the last few decades alone, nearly 50% of these forests were lost due to farming, and clear-cutting. We have alot of habitat loss in Canada as well, but it is a more immediate problem for panda's because bamboo flowers only every 80 to 100 years, and it takes 20 years to grow enough to sustain a panda population. Around the 1980's 150 panda's died of starvation when many bamboo forests died out inexplicably, which just goes to show how easily any population can become threatened by extinction. Your probably thinking what i'am thinking: Why dont they just eat something else? It would seem that the giant panda's digestive systems don't digest bamboo very well at all. Your average panda eats 40 kg's of a specific type of bamboo every day, but only absorbs 20% of the nutrients. And if that bamboo is not readily available, the panda will simply starve to death, even when presented with other kinds of food. Giant panda's do not reproduce slowly (contrary to popular belief), a female giant panda can have 2 -3 cubs in a lifetime. If 2 cubs are born at once (twins) one of them will be abandoned since the mother must focus all her energy towards one cub, the reason being that baby giant panda's are completly dependant on their mother for up to a year, and continue to rely on her protection for an additional year. Government agencies that aim to protect the already small number of giant panda's in various ways: Establishing breeding centers, conserving and growing the necessary bamboo required to feed the panda population, and my personal favorite, giving life sentences to poachers caught selling their fur on the black market. About sentences...killing a Panda in China meant death sentence in China before 1997...it is now up to 10 years and fines! We are what we are...a product of evolution. We are neither more special nor less important than any other species. We are Homo sapiens, that's all! Passionate about teaching and human performance. When I am not running, cycling or swimming you can spot me in a pub, a movie theater or relaxing at home with my wife and a glass of red wine!